The landscape of SEO has taken so many major changes the past year that the data coming in has SEO pros up against the wall as to how to survive. It’s becoming far more apparent that what Google is looking for are two things: fundamental honest competence and activity. 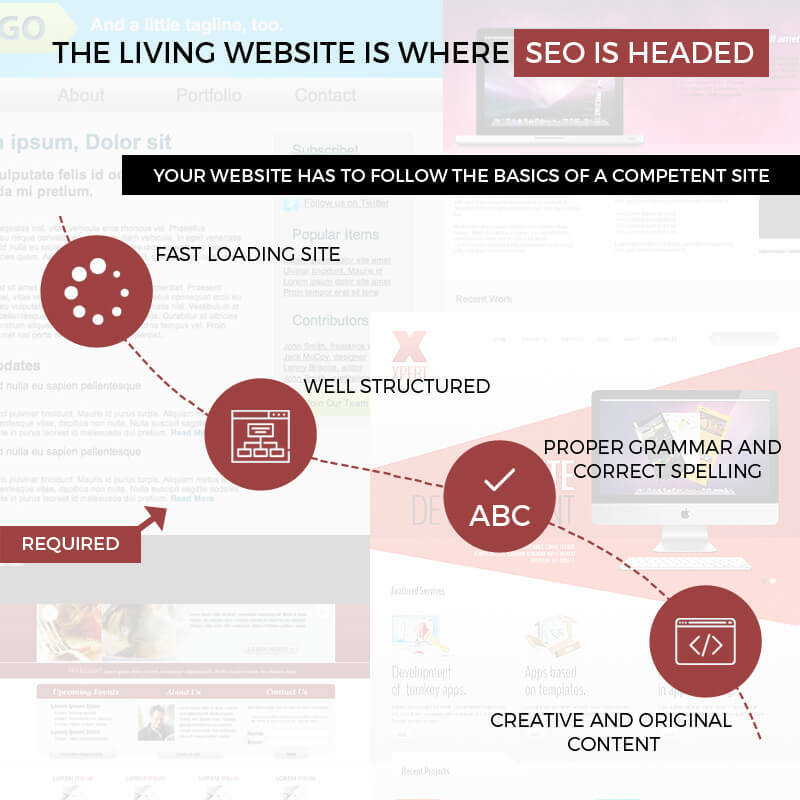 This means basically, your website has to follow the basics of a competent site that calls for all the sum of various parts that make up SEO. A fast loading site, well structured, easy to navigate, grammar and spelling correct, creative and original content that is relevant and helpful, and linking that shows real people are recommending your site organically via social media. Yes, your site has to be alive, like a living person that interacts in real time regarding relevant and present time data. This way Google knows your site isn’t just sitting there taking up space. This means the days of promotion and re-directing sites is soon to be over. Keywords are no longer important, what’s important is the activity your site projects and there’s no way to set up an AI, script, program, or automatic system to do this. This way Google can separate the chaff from the wheat and let the surfers choices dictate what should be at the top of the search engine food chain. Here how this is probably going to work. Forget about how many hits your site gets from social media. It’s going to be what those inbound links from surfers do after they’ve accessed your site. Are they navigating around the site, are they downloading content or commenting on the content? Are they going back to the origin of the link like a page on Facebook and mentioning your site and adding another link? How many people are using that link and also are interacting with your site? It’s sure the deep inside surfing and searching statistics will feed the AI programs of Google like RankBrain and it will get smarter and smarter. No one will be able to manipulate nor take advantage of it because the math is too big. This should shut out the scammers and spammers as well as criminals. In order to commit crimes against the new platforms means leaving a digital footprint so clear that it won’t take long for law enforcement to find the crooks. It’s becoming more and more apparent that Google isn’t going to bank on humans as much anymore because humans can easily be compromised. The need for huge staffs of people to police their interests is too much of a burden financially and other resources. Whittling things down to a system that can gather data and process data on a massive scale that ensures the most optimum results will make the surfers more confident and safer. Any website using the old standards will be left in the dust. Your site’s blog is going to play a big part here. No more cramming blogs with keywords, keyphrases, and key groups. It’s about the value of the data you present on your blog and how well others interact with it. The content you put up has to be relevant and entertaining with responses from the public that come from diverse sources, not just the same people over and over. Google is hip to people making fake accounts or paying people to post to make a site look important. Google is more than likely aware of metrics you have no clue about that will be able for them to tell in an instant whether a response or any interactivity with your blog is genuine or not. Getting busted is probably going to be more harsh than is aware of now. Google also monitors SEO and internet marketing message boards. Anyone soliciting for someone to make fake accounts or respond to sites on a paid basis will get hit so hard it might cause other members of such message boards to be penalized as well. That could be catastrophic as millions of people would get penalized because of a handful of dishonest people. It would call for these message board sites to instill far more stringent ethics and stick to it. The writing is on the wall as Google is accessible to technologies we’re unaware of and recent history shows they’re not so transparent as in the past. One day, millions of people using old school SEO and marketers using unethical tactics, websites and message boards not policing themselves regarding unscrupulous behavior will find themselves penalize and so far back in the search results that they might as well be invisible.